Dhaka Statistical Metropolitan Area has now extended to more than double the area of what exist in 1981, and by the end of century it will obtain 11.2 million population that will rank seventeenth mega city of the world (Mondal, 1997). Unlike other developing cities of the world population migration from rural areas of Bangladesh is due to rapidly increasing landless peasants, jobless fishermen and the village handcrafts become jobless due to import of textile, aluminium and plastic potters, household goods etc. from the cities. Unplanned growth of Dhaka city has already created adverse ecological effects (United Nations Fund for Population Activities (UNFPA), Bangladesh Bureau of Statistics (BBS), 1997). Dhaka's long traffic 'tailbacks' are discussed even far and wide at breakfast tables along with the insecure and free for all roads and highways; the impolite police force whose quantity has increased manifold but not the quality - policemen who are always on the look out for money from any source and on any count. Dhaka's face obviously started changing fast with the liberation of the country in 1971 when it eventually became the capital of an independent country. Total and fast urbanisation brought in with it all its bad tidings and slowly life started becoming a virtual hell. Muggers, mosquitoes, shortage of schools and colleges; dearth of cheap transport for the general public and the daily commuters; non-availability of pure drinking water; absence of health services at reasonable rates; and inadequate supply and fair price of daily essentials along with a deteriorating law and order situation which gained ground with the advent of the Ershadian era from 1982 onwards, literarily made life of those who lived in Dhaka absolutely 'nasty, brutish and short' as described by the great English philosopher, Thomas Hobbs some 350 years ago. The most famous air pollution episodes in the past occurred in London; Donora, New York, Meuse Valley, Belgium. But unfortunately the cities of the developing countries from almost negligible air pollution have become now most polluted cities of the world. According to Asian Development Report 1998, Dhaka is the most polluted cities of the world, ambient air pollution of Dhaka city has made a world record, abominably, as a number one pollutant breaking earlier record of Mexico city. "Outburst of airborne disease", a medical study claims , "has swept the city dwellers in mass". It ranges from skin diseases to cancer. Numerous ailments as eye irritant, severe headache, amonexia, disruption of blood circulation, respiratory problem and even death are being seen as a result of present environmental disorder (Rahman, 1998). There are any quantitative air monitoring stations in Dhaka but a few scatters studies show the alarming situation ((Environmental Pollution Report '98, DOE). The report describes that Suspended Particulate Matter (SPM) in the air is between 1000 and 2000 microgram, four to five hundred per cent higher than acceptable level. The size, shape, and density of an airborne particle determine how long a particle will remain in the atmosphere, whether or not it will be inhaled, and where it may be deposited in the respiratory tract. The solubility of a gas determines (in part) whether it will cause upper airway irritation or pulmonary edema. The particulate material can also absorb gases (including sulphur dioxide and formaldehyde) on its surface. The highest acceptable level of Sulphur dioxide (S02) is 60 microgram per cubic meter of air. But it has been recorded at 300 to 500 microgram in Dhaka. The amount of nitrogen is also three times higher than that of normal. Bangladesh Atomic Energy Commission reports that automobiles in Dhaka emit 100 kg lead, 3.5 ton SPM, 1.5 ton Sulphur Dioxide, 14 ton hydrocarbon and 60 ton Carbon Monoxide (Ferdous, 1997). Concentration of lead in ambient air of Dhaka city has been marked as world's record of 463 nanogram (ng,one part per billion) per cubic meter offsetting earlier record of Mexico city (383 ng) and other cities like Kyto (49 ng) and Los Angles (70 ng). Gaseous and particulate emissions removed downwind either by direct adsorption on precipitation or by deposition on surfaces, Many of the pollutants deposited dry on the surface return to hydrological cycle during the next rainfall as they are washed from the surface. The daily Janokantho on March 10, 1997 reports a very high content of lead in fish at Dhanmodi lake and advises to stop consuming fish. The University of Engineering (BUET) found 151 to 210 mg lead per litre in Dhanmondi lake. It is most likely that most of the wetlands surrounding Dhaka city are extremely polluted. The average suspended particle leads to particulate matter (PM) rises as high as 227 mg per cubic meter, where as according to WHO yearly maximum average value should range between 60-90 mg per cubic meter. Monitoring air pollution is inadequately carried out in Bangladesh due to the absence of trained personals and modern laboratory equipment. There is a great concern about the role of air quality in cancer mortality incidence. A brief description of specific compounds or compound classes very likely constitute Dhaka air presented below. 100-150 µg/m3 80 µg/m3 (Residential) 100 µg/m3 (Commercial) 472.9 ug/m3 (Commercial) 63.5 µg/m3 (Residential) Respiratory, chest pain, premature mortality. Inhalable Particulate Matter (IPM)- Particles that are size less than 15 µm can enter the tracheobronchiole and gas exchange regions of the lungs, and thus more likely than Total Suspended Particulate to produce pollution-related health effects (Lioy et. al., 1988). The chemical composition of TSP (total suspended particulate) and BSO (benzene-soluble organic) mixtures can vary considerably among cities depending upon the local sources of particulate matter. Many epidemiological studies have shown that where concentrations of airborne particulate matter are higher an increase rate of lung cancer mortality have been reported. Fine Particulate Matter(FPM) - The fraction of the ambient particulate matter that contains particles <2.5 µm in aerodynamic diameter which can penetrate the conductive airways of the lower tracheobronchial tree. These can be deposited in the gas exchange region of the lung. Extractable Particulate Organic Fractions - Also called extractable organic matter (EOM), these have the potential to cause adverse health effects. These fractions, and many compounds within them, have been shown to be mutagenic and carcinogenic. Investigators have found that the extractable organic material (EOM) from airborne particles is carcinogenic in animal bioassays (US EPA, 1984). The presence of polycyclic aromatic hydrocarbons (PAHs) in the EOM attributed to be carcinogenic and mutagenic. with chronic health problems in the workplace, including various forms of cancer. Lead- The main source of lead in atmosphere has been motor vehicle exhaust. Children are particularly susceptible to the neurotoxic effects of lead which may occur even at concentrations measured in the ambient air. Nickel- Sources in the atmosphere include fuel oil burning, electroplating, and steel production (stainless). Nickel and nickel compounds have been found to produce lung and nasal sinus cancer. Carbon Monoxide (CO)- CO is produced during incomplete combustion of fossil fuels. The lethal and subleathal effects of CO poisoning have been extensively documented (US National Research Council, 1977), and it is a criteria pollutant of the U.S EPA. Polycyclic Aromatic Hydrocarbons- Many of these compounds have been shown to be mutagenic and carcinogenic. PAHs are produced by fossil fuel combustion processes. Most of the PAHs are associated with the fine particulate matter (2.5 µm in aerodynamic diameter) present in air and originate during the combustion process. The U. S. EPA study estimated that roughly half of the cancer incidence assigned to air pollution is attributable to products of incomplete combustion (PIC). Many of these compounds are potent carcinogens which must be activated metabolically before gaining the ability to attack DNA. For example, benzo(a)pyrene is metabolized to its ultimate carcinogen, the 7,8-diol-9, 10-epoxide. PIC consists of organic compounds, including polycylic aromatic hydrocarbons (PAHs), as well as numerous PAH derivatives (nitro compounds, quinones, hydroxy and hydroxynitro compounds), PAHs degradation products, and hetroanalogs (notably containing nitrogen and sulphur). 1-nitropyrene is a carcinogen in animals and direct mutagen in bacterial bioassay (Rosenkranz, 1984). Some of these derivatives, for example dinitropyrenes, are such strong carcinogen that even very tiny conversions to these compounds are cause of concern (Lioy and Daisy, 1988). Vanadium- The main known source of vanadium in atmosphere is combustion of fuel oils. Epidemiology studies have linked increased vanadium concentrations with respiratory and hypertensive disease. Diesel run motor vehicles ,trucks and buses are rapidly increasing in Bangladesh, what once known to be environmentally sound is now considered extremely toxic. Particulate carbon in diesel exhaust is the most abundant component of atmospheric particulate matter that can cause visibility reduction, promote chemical reaction, and work as a carrier of mutagenic/or carcinogenic compounds. The organic matter extrable from diesel soot particles was first reported to be mutagenic in bacteria in 1978The diesel engine exhaust contains high concentrations of particles. These particles are of a readily reparable size and consists of carbonaceous soot and adsorbed organic compounds -.such as carcinogenic benzo(a)pyrene. It contains highly mutagenic chemicals including 1-nitropyrene (1-NP), nitroacetoxypyrenes, nitrohydroxpyrenes and other nitropolycyclic aromatic hydrocarbons (1-3). Recently Japanese scientists discovered in diesel 3-Benzoanthon, a very highly toxic substance was not known in the USA and Europe. They described that 3-Benzoanthon is carcinogen and like Dioxin, PCP and PAH poses serious challenge to human health and nature (ZDF, 27. 11.97). EPA's publication of the annual U.S. fuel use by category estimates that 44% of mutagenicity emitted into the air was derived from diesel vehicles, 22% from gasoline vehicles, and 32% from residental heating (Lewtas and Williams, 1986). A Swedish Government official report (Motor Vehicles and Cleaner Air) describes, "In diesel engine alternative, carbon monoxide, hydrocarbon and nitrogen oxide are relatively low in comparison with an equivalent gasoline-engine alternative. In contrast polyaromatic hydrocarbon levels were the highest measured during the tests, while those of methyl nitrite were also high. The diesel emissions also proved to be of a higher mutagenicity than any other alternative tested.."
The pollutants are complex mixtures of chemicals solubilized in air, chemicals solubilized in aerosols and chemical particulate. The general consensus in scientific literature is that health decreases with increasing air pollution. Increased human moralities have been associated with the elevated air pollution, elevating total suspended particles and SO2 by 100 µµg/m3 increased mortality by 7 and 5 per cent respectively (Schwartz and Dockery, 1992). High level concentrations both SO2 and SPM is particularly hazardous to health giving rise to increase mo^rtality and morbidity (WHO, 1993). In air pollution,air is the vehicle that conveys pollutants to biota (Prior and Lopenz, 1992). The chemistry of the pollutants in air is a dynamic process. For example, SO2 emissions are converted to sulphate, sulphuric acids, ammonium sulphate, ammonium bisulphate, and when inhaled, these compounds have properties of particulate. Hydrocarbon pollutants are oxidised and the oxidation products are important in the production of troposphere ozone. Low level exposures effects have been done in humans on photochemicals products. Concentrations of 100 µg of photochemicals products/ m³ causes headaches, 300 µµg /m³ is irritating to the eyes, 510 µµg/m³ is irritating to the respiratory tract and produces cough, and 580 µµg/m³ produces chest pain (Coppock, 1995). Moralities in Los Angeles area increase when atmospheric photochemical products reached levels ranging from 0.5 to 0.9 ppm. OZONE: Ozone is generally short lived at ground level. But once formed, the reservoir can replenish O 3 at ground level for 2 or 3 days. The toxic effects of O3 in the lower regions of the respiratory tract increase with increased minute respiratory volume. Animal and human test exposed to O3 shows pulmonary injury and pulmonary function decreases ranging from 12.6 to 20.7 per cent (Coppock, 1995). Ozone comprises the native resistance of the lungs to disease. OXIDES OF NITROGEN: Oxides of nitrogen (NOx) are a product of fossil fuel combustion. Of the oxides of nitrogen studies, NO2 has been studied most. Studies show with increasing exposure time, there is increased interstitial fibrosis and epithelial hyperplasia from bronchopulmonary junction to the proximal alveoli (Coppock, 1995). Coffin et al. (1976) found the concentration of No2 is more critical than duration of exposure in increasing deaths from bacteria-induced pneumonia. 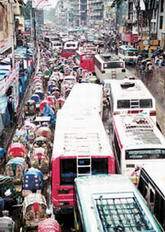 About 200,000 motor vehicles ply in Dhaka. In industrial countries lead added gasoline driven cars are almost disappearing and at the same time these harmful automobiles are exported to the developing countries in the name of "Reconditioned Cars". In recent years due to reduce tax these cars have conquered Bangladesh market. Three wheelers or two-stroke engine (auto-rickshwas) driven vehicles emit poisonous gases as these engine have very low efficiency to burn hydrocarbon. Hydrocarbon such as benzo(a)pyene are produced by incomplete combustion. Bezo(a)pyrene is classified as a proven carcinogen which in process encompassing the conversion of normal cells to neoplastic cells into a tumour. Auto-rikshwas are also using "processed burn-mobil-oil" in their engines. It is known in industrial countries that recycled old oils may contain many extremely carcinogen constituents like Polycyclic Aromatic Hydrocarbon (PAH), Dioxins etc. Besides "local mixtures" with many cheaper varieties practised in Bangladesh may create more serious health hazards. More than 80 per cent of the vehicles of the city are totally unfit for moving (Department of Environment, 1988). More than 50 per cent of the vehicles, moving in the city under the shadow of invisible power, have no authorised papers and they never bother to have any(a comment from an official from Bangladesh Road and Transport Authority, 1988). Brick producing plants in and around Dhaka are producing one of the worst hazardous emission of this planet. Apart from the destruction of valuable topsoil and palm and bamboo trees of the country, a highly poisonous mixing procedure has been developed by the brick-manufactures for the furnace at the cheapest cost. They use trees, coal of very low quality ( more than 10 per cent sulphur, very high ash content etc. ), used tyres (contain PCB, ) and used oil to obtain optimal temperature for burning bricks. Chlorine - severe and persistent acne-like rash. Birds - reduced hatchability and toxicity of the embryo. Solely blaming rickshaws for traffic congestion is not credible anymore. It fails to explain the never-ending jams on the so-called VIP roads where only motorised vehicles are allowed. A haphazardly expanding city with no regard to 'master plans' is to blame. So is the setting up of shopping plazas and office blocks with no or minimal parking space. People spilling on to the streets from the side force traffic to the right. Every year, nearly 25,000 cars hit the capital's roads. How long before we reach one million cars? Kolkata in West Bengal recently marked the arrival of its millionth car. Roads only cover 6 percent of their city. We have 8 percent. They seem to be coping better than us. Our government is rushing to inaugurate its first flyover this November. We are so keen, we are not prepared to wait for the right number of shock absorbers to be installed. In the meantime, Kolkata has constructed over a dozen flyovers, an underground metro system, bypass roads and more. Nearly all Asian cities once had non-motorised transport. From Shanghai to Singapore, Bangkok to Saigon, Delhi to Rangoon. Now pedals and cycles are disappearing as countries motorise their economies. Our leaders want to join the club too. They feel embarrassed when they have to accompany a foreign dignitary from the airport. VIP roads have been created to hide them but you cannot miss the rickshaw. Poverty hits you immediately you set out of ZIA airport. The rickshaw is the symbol of our backwardness. If you cannot get the real thing (getting rid of poverty), why not accept its substitute -- the appearance of 'modernity'. So we attack the symptoms, not the underlying causes. Always looking for the shortcut.ÊIn January, the city will be hosting a motley crew of South Asian leaders in a SAARC summit. So the city is in the midst of a 'beautification' scheme. Have you noticed the flowerbeds and trees being planted? The journey along the VIP roads is being choreographed, like the catwalk in a fashion show. The irecent impetus for the anti-rickshaw drive came from two sources. It was "Traffic Week" and they had to be seen to be doing something decisive. Moreover, a World Bank mission had been in town to check on their flawed Dhaka Urban Transport Project. They showed their displeasure at the slow progress in withdrawing the rickshaws from the main thoroughfares. They have grudgingly 'extended the deadline' for our authorities to carry out the attack on the rickshaws. They may have to revise their calculations if the show of strength continues this winter. Our current vision is to see a minority of middle-class consumers in 'rickshaw-free' roads jam-packed with cars crawling their way to shopping malls, along boulevards lined with flower-beds. Is this meant to be 'beautification'(F. Bakht ,October 28, 2004)? 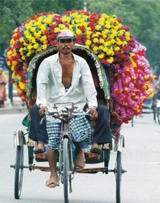 Banning rickshaws today and getting rid of them from Dhaka will make the traffic situation worse! No, this is not a typing error. Please read on with an open mind. Until now, you have been fed the propaganda against rickshaws. Reading this newspaper means you probably own a car or certainly ride in one. So you know the solution. It's been written in countless articles and letters. Get rid of rickshaws and the streets will be smooth? Think how many pictures (perhaps even in this newspaper) you have seen of rickshaws causing huge traffic jams. You have seen it with your own eyes. But what have you really seen? Ambient air of Dhaka has become a deadly pollutant reaching a level of all times and it can be declared as one of the worst polluted cities of the world. Eight million vehicles runs in Los Angles show lead content between 0-70 nanogram (part ber billion) lead content in cubic meter , whereas Dhaka with 200,000 vehicles has been marked as world record of 463 nanogram (one part of a billion). Environmental researchers attribute the pollution to vanishing green trees making way for concrete structures, unabated growth of industries and brick fields in city area, double stroke engine vehicles and dumping of garbage on road side. 30-40 percent of Dhaka population living in the dirty slums of the street corners has been thrown into a gas chamber with the consequence of severe health hazard. Since air has no boundary and the rich people living in the city has no alternative protection. Members of the parliament enjoys to import tax free luxury cars and there is little effort on preventive measures. Sustainable development can take place only if we can integrate the non-motorised transport into the mechanised vehicle network. About 96 per cent of vehicles in Shanghai are bycycles, 50 per cent are bicycles and rickshaws in Phnom Pehn. Our politicians can set an ideal example - instead of intensive using of luxury cars they can also use rickshaw. If they are people's representative - peoples transport of one of the poorest countries of the world will bring them close to the people. There is not many choice - whether we want to live to some extent healthy, breath fresh air in a restrictive non-motorized city for generations or continue to live with increasing pollutants in air, water and soil resulting one of the worst hazards of mankind. World Bank or Foreign Aid can not help us to solve the problem but this is only our will and determination can show an immediate solution. A radical programme is required, then birds will sing, fresh air will blow gently on green leafs..